The Port of San Francisco (“Port”), a department within the City and County of San Francisco (“City”), is a self-supporting, municipal enterprise agency overseeing 7-1/2 miles of waterfront property along the San Francisco Bay. The Port has initiated a program to identify and upgrade portions of the waterfront vulnerable to earthquakes, flooding, and climate change. 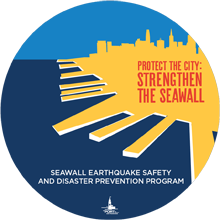 The Port, through this Request for Proposals (“RFP”), seeks a qualified* Contractor to complete an earthquake vulnerability study of the Northern Waterfront Seawall which extends approximately 4 miles from Fisherman’s Wharf to Pier 50. Components of the study will include: assessment of available information and condition, state of the art engineering analysis to determine likely damage to the seawall and infrastructure within the zone of influence, economic impacts resulting from multiple earthquake scenarios, development of conceptual level retrofits/costs, and recommendations for implementation of improvements and/or further study. The selected Contractor shall provide all services, labor, materials, and equipment necessary to complete the scope of work described in this RFP. The Port strongly encourages City Contract Monitoring Division (“CMD”)-certified Local Business Enterprises (“LBEs”) to submit Proposals and will provide LBE prime Proposers with a ratings bonus in accordance with Attachment II. *Proposers must meet the Minimum Requirements described in Attachment V, to be considered for evaluation.